I started to write my first chess program for casio prizm calculators. The display has been already done but nothing else yet. The board and the figures are rotateable in any direction statically and dynamically (the board rotates depending on who current player is), these can be set in the settings. Here's the first screenshot. I know, the figures are a bit ugly, they might be replaced. Actually, I think it looks pretty awesome. There's a tiny bit of aliasing on the king and queen, but other than that the sprites look superb to me. Are you planning to make this a game for two humans, a human and an AI, or both? Either way, hats off for a rather ambitious project; I think you're up to it. your chessboard looks rather cool. 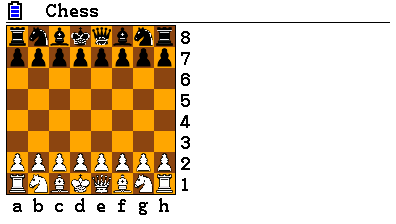 Some time back, i wrote my own chess engine. i wanted something *very* small so i could embed it into portable devices like the arduino. The other thing is i wanted to make an engine simple enough to understand, just one "c" file and completely free for anyone. thanks for the nanochess link. Unfortunately, these are competitions to build the smallest chess source code, they may well require megabytes of ram when running. Back when i wrote mine, i couldnt find anything that would run in very limited ram. 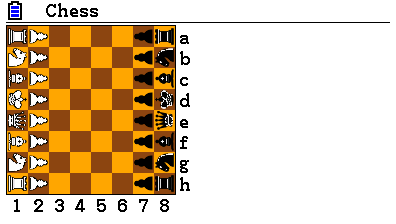 i wanted to embed chess into a PIC. That's also why the program is in C.
You have to press EXIT. And if it's the first time you have to scroll down to the bottom. Glad to hear it, and good luck! Will the first release have an AI? © Copyright 2000-2019 Cemetech & Christopher Mitchell :: Page Execution Time: 0.187626 seconds.